In Dec. 2005, the below writer, Roger Gorringe, interviewed John Force about such as his future plans in NHRA FUNNY CAR racing. You may or may not be aware that every FC race Force ever won, his car was powered by a CHRYSLER HEMI® motor. Here's a direct quote from John: "For all the cutting-edge, next-generation vehicles there's no place else like the LA Auto Show," Force said. "There, we can show just how much muscle Ford packs into the 7,000-horsepower Castrol GTX Ford Mustang Funny Car engine. 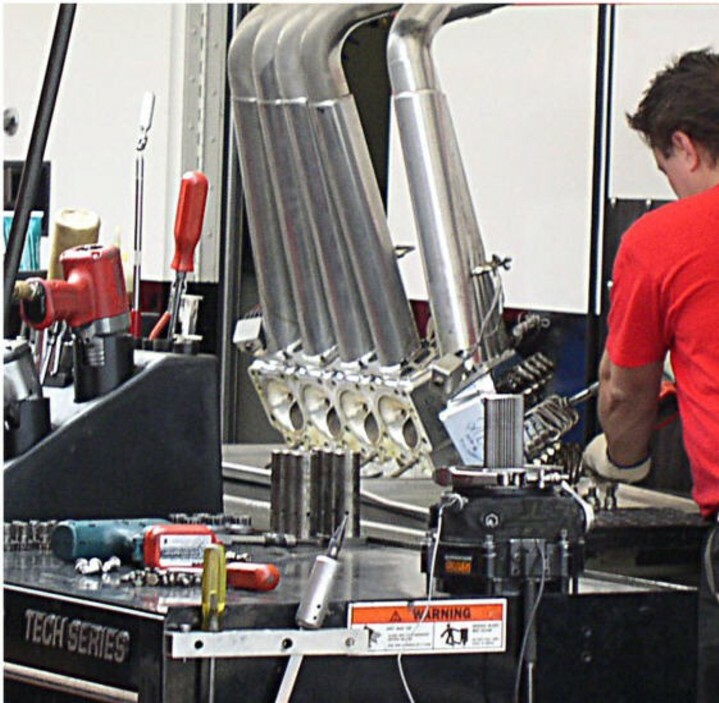 Since 1997, Ford has been an essential part of John Force Racing. I am pleased and honored that we can bring my hot rod to the LA Auto Show and highlight Ford Racing's success and also show off a creative King of the Hill paint scheme." But John, it is a CHRYSLER, not FORD, engine. Roger Gorringe: Your plans for 2006, I guess it's to recapture the title? John Force: We're in the development to build an all-Ford motor, NHRA-spec motor. We've been given the equipment by a company called Facial, Fadal Machinery Giddings and Lewis. it's a worldwide corporation that will take us into the market. We've got a big machine shop in LA. We build our own blowers, our own heads, clutches, but now we're gonna build the block. Because we want an all-Ford motor and yet we have to fit underneath the NHRA….this won't be a Chrysler design, everything evolved from the Chrysler. This will be a Ford spec motor by our brain trust, it's an exciting new time to grow because the financing's there, because who can afford to go out and buy ten million dollars worth of equipment to build machinery? I went after a sponsorship six years ago, I said I'll supply the money for the suppliers to buy the manpower, and they'll work with us with technology, and Fadal Giddings and Lewis will supply the equipment, that's two huge companies worldwide. And Ford's really into It. OK, let us fast forward to late '06 to early '07 and lookee, the much anticipated, new FORD nitro engine is alive, well almost. Does anyone recall some 35-40 years ago when Ford made their last venture into nitro racing; what a disaster, if they didn't explode on the starting line, odds are they would near the end of the quarter mile. In the several years of hired gun drivers, and they were about the best of that era, they won a total of 4 races before throwing in the towel. Here's where the big, BOSS news really starts, and from the real horse's mouth. This is an excerpt from the biggest of the big wheels of Ford Racing. Racing enthusiasts know that the true heart of a race car is its engine - and Davis wants to make sure that the "heart" that powers NHRA Funny Car Mustangs of John Force Racing is pumping "blue" blood in the future.Davis and John Medlen of John Force Racing challenged themselves to develop the new Ford BOSS 500, the first modern nitro engine for drag racing. The BOSS 500 was tested on-track for the first time on Oct. 18 and was unveiled for media today. "We wanted to be in NHRA Funny Car with an engine that we really could call all our own," Davis said. "I wanted people to see a Ford Mustang race car and know that it's winning races with true Ford power." Davis and Medlen looked at the current nitro engine, discussed where they felt it had weaknesses, and decided to design and build a new engine to address them. The BOSS 500 is the first nitro drag racing motor designed with analytical tools. 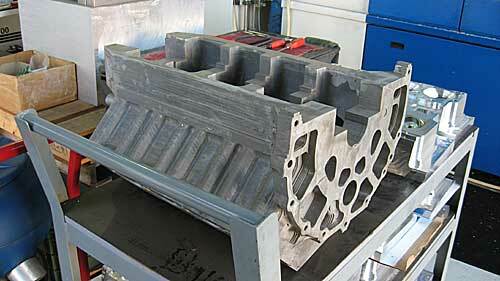 It has a strengthened block for better durability and new cylinder heads developed by Ford and Force engineers. The basic design will favor areas such as the main caps register and the main webs in the block. Its engine block also is anodized blue after machining, helping ensure fans and competitors alike know when they're seeing a Ford nitro engine under the hood. Most of the external surface areas on the new 500-cubic-inch engine have been redesigned; a new belly pan was designed for better sealing; and the valve covers purposely call back the old Ford BOSS motors. The engine also features Ford main bearings with actual parts numbers in the Ford performance catalog. "Second, on the technical side, we have always helped out with aero, chassis development and now safety, but we always stopped short of the engine. This project has been a technical exercise for our engineers and the Force team to take the current motor, redesign it and make it a Ford. "Finally, we want fans to associate this engine with Ford and Force, but we also know this provides a new revenue opportunity for us," Davis added. "In Funny Car, the plan is for this to be a John Force Racing-exclusive engine at the start, but we do want to be able to sell it to Top Fuel teams for competition in the near future." Davis said that the current plan is for new Force Mustang driver Mike Neff to use the Ford BOSS 500 engine full-time in 2008 as it goes through its development phase. The other Force Mustang drivers - John Force, Ashley Force and Robert Hight - will use the engine after it has been further developed. Ford and Force Racing also are investigating a team to be the first development operation in Top Fuel, with a measured, commercial rollout to more competitors after it has gone through a prove-out stage in that division. 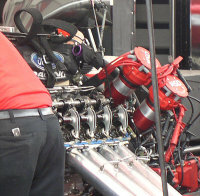 On 3/28/08 I attended the NHRA Houston, TX event to see a day of time trials and get my semi-annual fill of nitro fumes and hear the thundering roar of 8000 or so Horsepower engines. While there I had a chance to see and take pictures of the the FORD (warmed over Chrysler) engine and have a little conversation with Mike Neff, driver of the aforementioned car. I asked Mike, "Is it really a Ford or is it a warmed over Chrysler"? Mike replied, "It really is a Ford". I then asked Mike, "Is it a "push rod hemi"? Mike replied, "Yes". I said, "Then it really is a Chrysler wearing a Ford badge". He then replied, "Well, it has got Ford main bearings". OK, I have a couple of pictures which show the cylinder head is a true HEMI, plus a shot of the very unique style HEMI rocker arms which by the way first appeared in 1951 Chrysler. Neither of the two above pictures reveal anything remotely near the design of any engine ever built by Ford or any automotive manufacturer except Chrysler. It seems that Force/Ford want to "hang their hats" on only the engine main bearings in order to claim it is a Ford design and this brings to mind how that years ago a main/rod bearing oiling problem was solved as noted in the following excerpt and link. From the start, Pete struggled with oiling system problems with the little Ford motors. The Ford, of course, was a purely passenger car based design and was never engineered to handle the kind of power output (supercharged, on gas or nitro/alcohol) that Pete's modifications produced. The result was a serious "appetite" for main and rod bearings, this problem being severely accelerated when Pete ran on fuel. (Hardly a big surprise!) He finally solved those problems by enlarging the entire oiling system, rerouting more oil to the mains and rods, and building his own large-volume, high-pressure oil pump. Ironically, when Pete went to the new SOHC 427 Ford "Cammer" he ran into more oil system problems, as did all the Ford Cammer racers who ran blown motors. (The injected nitro motors seemed to survive with only moderate maintenance) This caused considerable grief (Kalitta destroyed "truck loads" of SOHC 427's in the early days of running the Fords! ), and Pete spent a considerable amount of time "bottom-end diving" to replace mains and rods that were "one-pass wonders." The final cure for all those woes was the adaptation of the basic oiling system developed (also by much blood, sweat and burned bearings!) by Chrysler for the then-new 426 "Late Model" hemi motors. Ford guys also found their parts problems eased because they went to Chrysler style/size bearings and the Chrysler oiling systems. You might wonder why I chose to name this little story, "THE BOSS IS BACK". While I was at the Houston race, sitting in the stands, some kid comes up, sits right in front of me and he has on a new T-shirt with written on the back, "THE BOSS IS BACK". sounds like the "BOSS" is still taking it in the "BACK" - the photos you showed look like no FORD engine i have seen - sure looks like a Chrysler based HEMI to me. Regarding the problems with the 427 Cammer motor. most racers had moved on from the Cammer anyway. The Top Fuel/FC engine making some 8-9000 HP is an incredible monster and really complicated and misunderstood. In order to prevent self destruction from detonation the engines are ran very rich which slows down the combustion process and at the same time holds the combustion pressure down as well as lengthning the pressure as the piston travels downward. Actually it may be more like a Diesel cycle that an Otto cycle. So, when the cam tries to open the exhaust valve at some 40 degrees before bottom dead center there is considerable combustion pressure on the valve head attempting to hold it shut and of course the 6' long bicycle type chain used in the scammer is not going to like the extra pressure. And keep in mind, I've read in several places that the spark plugs actually burn up somewhere before the end of the run and ignition is caused by compression and the glowing remains of the plugs. The opening of the exhaust valve with high combustion pressure causes the extreme noise and extra loud popping even when at idle rpm. This is for an unblown nitro engine. I am very surprised the EVO, exhaust valve open is as early as it is at about 97* ATDC and look at the pressure still in the cylinder. I would really like to see one of these charts on a TF/FC engine making up to max. HP. Henry Ford had a working vehicle in 1896, & Ford started Henry Ford Company in late 1901. Henry Ford Company was not the most profitable company due to an advisor in the company. Chief Engineer Henry Ford saw that the company was headed nowhere & he sold his shares in Henry Ford Company, later to become Cadillac Auto Co & obviously sold to GM in the mid ‘20s. How do you figure that? Flatheads aren't even OHVs. The idea of the hemi is to get the a/f mixture to explode like a shape charge. Having the plug in the middle of the combustion chamber is the first step in this process. When the piston nears TDC the mixture is ignigted & the resulting explosion explodes in on itself building TREMENDOUS pressure. This is true for Flatheads too because their plugs are in the optimal position. The only drawback is that the valves are off to the side, less flow, less compression, less even pressure & from the shape charge effect. But Flatheads were the norm for the longest time. Me not being an engineer, take this with a spoonful of salt...OK on the plug location, makes a difference, flame propogation and all that. I think the single biggest factor is that a hemispherical chamber allows the valves to be canted and somewhat opposing each other, valves opening away from the cylinder wall. Clear shot down the port into the cylinder. And straight ports too, no twisting to get around the casting requirements of say a wedge. What is that you do when you port? Not just making the port larger, but a better shape often too. The literature says Chrysler developed their design for WWII inline(straight or V, I dunno) aeronautic engines. my opinion only but I think this has more to do with double rocker shafts than hemi chambers per se. Initially Chrysler billed their new engine as 'double rocker shaft' or somesuch, so that might give us a clue as to what they thought was the innovation. Radial engines often used hemi heads and valve arrangement before that, so no chrysler didn't invent the hemi itself. The radials, as I recall, had pushrods and rockers and a weird kind of cam. It actually was a bumpy rotating ring rather than a shaft. A lot of motorcycles have hemi heads, pushrod or OHC. Look at a diagram of a flathead, the intake charge has to snake its way thru the port turning roughly 180° or more. Restriction. Look down the port of a hemi and you can see the cylnder wall opposite. Much less restriction. That's probably why Duntov designed hemi heads for the flattie, to open up the breathing. Who stole what from whom? I dunno, who cares? It is possible for designers to come up with essentially the same thing at the same time, but independently. I've been thinking that after I finish my hemi project, which might bust my retirement, I should do a flathead. Juxtaposition. You're right though, at one time the flattie was THE engine for hotrods. Later it was the hemi. How cool would it be to represent the forties and the fifties hot rod scene with two very different but equally historic motors? Except for the Chrysler factory and popular language for the last 60 years. "Hemi" means hemispherical, or half-sphere - nothing more, nothing less. Hemi does not even define an engine, but a 3-dimensional geometric shape. Having the plug in the middle of the combustion chamber is the first step in this process. Almost no hemi motors have a centrally located plug - there's no room between the valve seats. On the other hand, conical chambers, as found in some 2-strokes, are not anything like a hemi (no valves, no curved walls) but do have a centrally located plug. This never happens. There is no explosion, and the combustion begins from the plug gap and the flame kernel radiates in all directions o - u - t - w - a - r - d.
This is true for Flatheads too because their plugs are in the optimal position. No, the plugs are almost always above the intake valve, or at least 80% of the way toward 1 end of the chamber. I've never seen a production flathead motor with a central plug. Exactly which flathead engines have you worked on? Hey jturner427, I really don't have the time or desire to detail that most you have written is incorrect, but here's a little ditty I wrote for another board. Enjoy. disappoint me by not dignifying me with a response. said, the way I'd say it. article I'll post it here. Feel free to delete it as you wish. what paint is, but anodized is probably a mystery. Dragster in NHRA is powered by a Chrysler engine or a derivative of the Chrysler design. Nothing else. to them by the Chrysler powered cars and all of the nitro burning cars were and still are Chrysler powered. John Force has tried to appease his Ford fans by coming up with his amazing "Ford" nitro motor. Ford main bearings, painted it "Ford Blue" and modified the cylinder heads to accept Ford rocker covers. wins a race or championship is just pure tripe. Not too long ago I saw a Top Fuel dragster that said "TOYOTA"
for that one? Who is allowing this garbage to proliferate. Why is it tolerated? Why does it continue? A lot of things can be done to an engine to make it quite different from its stock condition. which must now be fitted to custom pistons to accomodate the Chevy wristpins. the heads on that engine are the same ones that were on there in the first place, Chrysler's. a bloody disaster of an engine and you couldn't give me one of those. If Ford wants to bring the Mustang into NASCAR; fine bring it; but I've listened to all the "Mustang has dominated"
garbage I can handle. In other words, I think that Brian Wolfe should shut his pie-hole. Re: THE BOSS IS BACK; Thats right! Well i guess those engines Force is using came in a Chryler 300. Probably around 1962. Get real. The truth is this. No U.S. automakers have released a motor for racing with hemi heads on it that you could buy in one of their cars off the showroom floor. since the 70's. Anything after that has all been the aftermarket period. And as far as the Ford Boss 429 motors being copies of the Chryler engine. Well the Boss only has a 93 cc combustion chamber. And what does the chryler have? 174cc's??????? and the Boss has its own valve angles. And its valves are twisted and off set unlike the chryler. You have no argument with me that the Mopar Hemi is best for nitro racing. The chambers are big enough thats for sure. And that works great for blower motors because of the VE. However the Boss is much better for gas powered racing. NHRA IHRA. If you add up all the NHRA and IHRA Pro Stock wins by different manufactors. I see Chryler in 3rd place. Big Chambers don't work well with gasoline. two spark plugs helped. But unless your running nitro. The Hemi is not king. I have'nt seen any nitro powered cars being in the Chryler show rooms for sale to the public. But they would sell you one if they could. The feds probably shut them down for doing it though. In fact the CHEVY HEMI is nothing more than the Boss 429 head with a fancier valve cover. It uses the same valve arrangment as the currect IHRA Boss Pro Stock. So see. Its not the automakers building this stuff. Its the racing folks who want to win. And the U.S atuomakers are there to claim involement. Hey when Mopar was racing back in the early days. They were a force to be reckoned with. But you have to give credit where credit is due. The Boss Hemi ford has done its fair share of stomping the competition on race day. What i can't stand is when some of think that some how a Einstein was working at chryler. And somehow this guy knew and could see into the future. B/S, The Chryler Hemi came out and was in the right place at the right time. If drag racing had never started up. The Mopar Hemi would have died. The Hemi weighed too much and it was a huge gas hog. It would have faded away. Believe me when i say no one working at chryler at the time knew what was coming down the road. They were just lucky to have that motor when they did. Remember this. Back in the early days. It was'nt the lack of money to go fast. It was the lack of developed engine parts. Very much different from today. Today you can build anything you want. The problem today is how much money do you have? And don't forget when a V6 Buick with 231 cubes was racing in IHRA Pro stock. How could a 231 Cube beat a 665 cube big block Hemi? Its called technoligy. TURBO's. But don't kid yourself. The Chryler Hemi and the Ford Boss did'nt get to be as fast as they currently are because of the U.S automakers. It was the crew cheifs and engine builders like you and me that made these motors win. While the automakers rode our shirts tales waving their banners claiming to be the einstiens behind all these victorious wins. It was guys who love drag racing that sat up without sleep for days in a dyno room looking for more power. The automakers are in business for one thing. SELL CARS. AS dangerous as Nitro fuel racing is. Did you expect Ford to completly redesign the Nitro Race motor? And you don't think if it was sucessful mopar would'nt go ahead and copy it. Hey what works in top fuel today is what everyone is running. But its not the Chryler Hemi you buy at the local dealer today or even back in the 1970's. And from what i've seen lately. The 2009 2010 cobra jet drag mustangs are faster than the Hemi challengers and camaros. Now this is factory involement. Nitro racing has nothing to do with the automakers ford or mopar. Ford probably is devevloping another winning Pro stock motor that won 5 world championships. 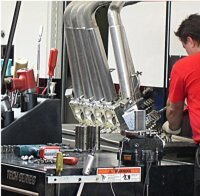 They may just be using John force to develope the new blocks and heads for Pro stock. Its a test bed so to speak. The truth is they want your business and your money. Just like the old days. I say build your hot rods and enjoy them along with anyone who's owns a Ford Mopar Chevy. The chongs don't get it. Take a chong for a ride if you want to change the current minds of the day. The point is have fun. And respect all hot rodders despite what you think is right. Fords have won. Chevy's have won. Mopars have won. Its all about making money. Yours and mine. Spend your money and build your Hemi. I'll spend my money and build my Boss. Don't run around town looking to race 4 banger pinto. look for some real competition. And when a Fast Boss ford pulls up beside you that you feel will stomp you. Don't put your turn signal on and go the other way. Theres always somebody faster than you. And if you get beat. You'll just go out and by more parts to beat this guy. But remember who's making the money. Its an endless cycle. But its sure fun when you win. And you can hold your head up high and brag to everyone. Somebody faster will find you in due time. The question is this. Will you race? or will you run? And if you run will you still brag about the past victories? Because the past is just that. Have you ever taken the time to count the Ford powered entries in a NHRA event; at the most about 30 or so, why, they know they can't win. But back to the Ford\Force scam which is what this topic is really about. It's like this, if you like Fords, OK, but why does anyone want to drag Mopar down in this muck. I say it takes a subteen mentality to look at the evidence in the scam story and not know the engine is nothing more than Mopar wearing a boss 500 badge. And by the way, the following story tells how and why Glidden was able to win the pro-stock races. Ford simply agreed. And if you get bored, here's a little about what I was doing in the 60s. Re: THE BOSS IS BACK; THAT'S ROT! moparornocar. It gave me a headache to read post #14. Convoluted, non sequitur tripe, all of it. word from the beginning of his post. Yes, he is a lower case "i". involved with the HEMI engine, with both a street and a separate strip versions. 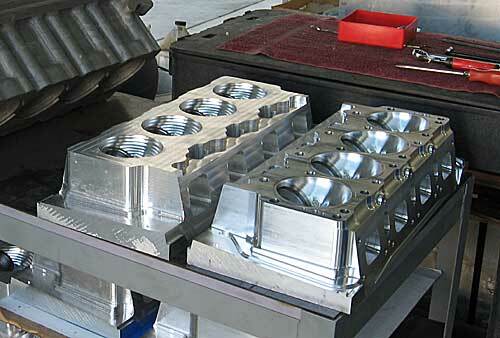 The new 426 HEMI and 440 Wedge blocks from Chrysler are superior castings from all new tooling. the HEMI. I've even seen Chevy Rats and big block Fords shut down handy, by a 340 smallblock in a Duster. The 340 isn't called "the giant killer" for nothing. transmissions for those who for example prefer to run a two speed PowerGlide which seems to be popular. Cast iron HEMI street block part number, P5153862. Accepts all stock components with factory part numbers. unmachined lifter bores and raised cam tunnel. As for the 429 BOSS being the weapon that Ford wants everyone to think it is...uh,no. I won't get into it here but suffice it to say the 429 "semi hemi" was a high rev NASCAR engine, not a drag motor. and peaked at 4500 rpm instead of the intended 6000. The quarter mile performance of the Ford Mustang Boss 429 was anemic at best, considering the message Ford was trying to send. To put things in perspective, the 1969 Ford Mustang Boss 429 did the quarter in 14.0 seconds at 103 miles per hour. A 1968 Oldsmobile Ram Rod with 350 Olds engine and M22 Muncie 4-speed did the quarter in 13.98 @ 103. As a matter of interest, in the latest edition of Hot Rod magazine, there's an interview with Don Prudomme. In the feature he states that the SOHC 427 Ford would only last a weekend when raced on Nitro - it was designed for NASCAR, remember ? - and "the block would be all cracked". PS: The feature - the quote is on the second page, attached to one of the photo's near the end of the feature. PPS: There's a follow up feature too - search Don Prudhomme on the HRM search. So, where are the Ford fans with their weak, make that simple minded, replies about how great Ford racing is. Truth is this simple; ignorance is the engine that drives Ford and some of the previous posts prove it.